Is ten minutes of teaching enough? So, Colleen’s to do list (which I am mighty impressed by) reminded me of the call for papers for the Library Instruction Cookbook. Which seems like a great idea, tons of active learning ideas! Also, something I would love to contribute to. I do active learning (after all, I went to Immersion. We learn lots about active learning at Immersion!) And I’ll be the first to admit I struggle with content coverage and integrating active learning. But this criteria just rules me out completely! I was thinking this would be a great place for my call & response web page evaluation exercise, taking a completely different approach to teaching evaluating. It’s an exciting activity, and my favorite class to teach. It is very active, and the students are always more engaged here than any other session. They are so engaged that this semester I found I ran out of time due to student participation. Kind of awesome, but also worrisome — I don’t get to cover the rest ‘tomorrow’! But I talk for more than 10 minutes. And I talk for more than just the very beginning of class. We interact. The whole hour. Does that mean this isn’t good active learning? Is active learning defined only as introducing something and then turning students loose to do their thang, and then letting them debrief (because if I debriefed, that would certainly exceed that magical mystery minute mark). Plus, I have this concern. Am I really misunderstanding the whole nature of teaching, and information literacy, and the course-related one-shot in a non-integrated curriculum? Is it even possible for the students to get enough useful library information with 10 minutes of instruction? I’m open to being shown how this can work, I really am. I’m also very curious if any of us has been so bold to take just 10 minutes for active teaching and leave the rest of the precious class time to active learning? Convince me, cajole me,mock me, support me — where do you fall? what do you think? Categories: Uncategorized | Tags: active learning, infolit, scholarship | Permalink. My own personal ER episode…. If it were Grey’s Anatomy there would at least be some McSteamy and some hanky panky, right? I have so much work I’m supposed to be plowing through right now, but the medical situations going on around me (well, around my life. Most are going on 1000 miles away, which is an added stress!) have been extraordinarily distracting. A friend is being treated hyperbarically for Necrotizing fasciitis. Really. Another family member is now out of ICU after developing pneumonia after surgery to repair his esophagus after it was torn being given the Heimlich maneuver. Because he was choking. 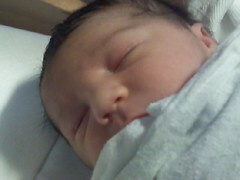 I am an aunt! Yesterday my sister-in-law gave birth to my nephews Max and Gabe (7 lb 11 oz & 6 lb 9 oz) after an exhausting and long day in hospital (that’s Max in the pic). It’s very exciting, and I can’t wait to see the pictures! However, poor sweet Gabe is having some blood sugar issues, and has an infection, and is in the NICU. It’s hard to be an aunt from far away when this is going on! Luckily I will be heading to the old homestead in less than 2 weeks. How crazy is it that work goes on in the middle of such distracting events?? That deadlines and time-frames remain in place and not subject to the whims and whirls of my life?? Seriously! Thanks for indulging this I-promise-very-rare non-work/library related post. I also promise that pictures of my boys will go up when I get them. Now, off to find McSteamy and McDreamy and shake things up! Categories: Uncategorized | Tags: un-professional | Permalink. Can twitter do it all? Which raises the question of quality: am I getting more quality out of a sense of community and a hive mind I tap regularly to resolve tough and easy questions, recommend readings, and otherwise support my work and fun than out of the biblioblogosphere in general? Is twitter robust enough to replace all the rest of the digital library ‘verse? Am I depending too much on 140 character missives?? How about you? Have your social networking habits been changed lately, and if so by what force? Am I part of a trend? Or am I just so thrilled to be following zappos shoes (not to mention the House and Senate floor!) that none of the rest of it really matters? Categories: Uncategorized | Tags: ponderings, twitter | Permalink. It’s funny how long ago last week feels today! If you’re just looking for the overview, here it is: Computers in Libraries is an amazing and inspiring conference, with lots of folks talking about innovating, in reality. What they’re doing, and how they’re doing it, and more than the usual complement of why they’re doing it. The name is only sort of fitting, as the conference really only covered a narrow slice of the possibilities inherent in the title. But it’s a great slice! Also, for now it is a nice smaller conference, about 2200 attendees, plus exhibitors and others. It’s growing rapidly, and with some few growing pains. I expect the flavor to change pretty soon. Lee Rainie gave a keynote that many previous attendees of CiL passed on (and next year I will probably do the same). He was inspiring and all, but I felt like I was in an ad venue somehow — too slick and shiny, and I honestly expected more substance and depth from the folks at Pew. In the Information Age, Information is: abundant, cheap, and personally oriented. If you include uploading pics to Facebook, 39% of online teens share creative content online. Personally, I think a distinction needs to be made between sharing content and creating content, but I get a little lost in the semantics. Basically, if my users just want to upload from the camera or their word processor, I can help them in certain ways. However, if they want to create online content (and I know I’m not pulling the right words here) then I the librarian need to have other abilities ad tools at hand: video editing software, graphic design tools, HTML editors, I don’t even know what else. Not making that distinction is unhelpful for telling me about the skill and engagement level of content creation behavior of teenagers. Thirty-three percent of college students keep blogs and regularly read posts, although the distinction between blogs and the Web for students is growing increasingly fuzzy. This has important ramifications for instruction librarians. I ask students all the time if they read blogs, and most have never heard of them. It’s one thing to not know you’re reading a blog in Facebook or MySpace, but it’s a more difficult distinction out on the free web. Does it matter (and if so, how?) if you are reading a New York Times reporter’s work in the newspaper, the newspaper’s blog, or on Huffington Post? How about a professor, say an anthropology prof keeping in touch with her friends from far away places? how should we be talking about the distinctions? Another nice tidbit, 19% of online young adults have created an avatar that interacts with others. That’s a very specifically worded stat, and the number is so much higher than I would have guessed! I’m curious if MORPG characters are considered avatars? If they are not avatars, then this marks a large gap in my knowledge of my users! These were both very engaging sessions, with lots of information about cool new (and not so new) tools to try out. The one thing they all lacked, however, was any engagement or understanding of how the free tools managed users information, and this has become a real point of concern for me. LibGuides appears to keep no information, but the various widgets being created at Penn State and other places using WidgetBox? No one had really looked into that. Which is unfortunate, because WidgetBox seems to be wicked cool,and i would love to talk about it with my colleagues. And the clean usability of the Penn State research quick links page? fantastic! But I feel too strongly that anything I put on my campus’ Library website carries the Librarian Stamp of Approval, and that we are responsible for teaching our students about their digital footprint, and how to protect their digital privacy. So, le sigh, it was wonderful, but I’ll have to do a lot of that legwork myself before passing the excitement along to my colleagues and our users. I do want us to start looking at LibGuides, though! tomorrow I’ll post more responses to the conference. I will, I promise! Categories: work | Tags: cil2008, conferencing | Permalink. post temporarily pulled into editing mode…. I’m sure the content is wonderful, but the typos and grammatical shorthand I use when taking notes really isn’t something to show the world 😉 This weekend, I’ll make it all shiny and thoughtful and post it back, along with its compatriots. And the typing? I have to admit that my shoddy typing was a conscious choice, a proto-feminist decision, made when I was in 6th grade. My school required a trimester of typing and I declared that I was never ever going to be a secretary and flat-out refused to learn how to type as a defense mechanism. The world, she has changed since then and while I struggle to type accurately (I do in fact type very very quickly) I don’t think I can regret the willfulness of that 11 year old to defensively plan a career path, but I will always regret that it involved taking a stand on a skill that has become as de rigeur as breathing. please forgive. Categories: Uncategorized | Tags: cil2008 | Permalink.